3in super-stik wht x pk/1..
3in white 1 (pkg. of 10)..
3in white 2 (pkg. of 10)..
3in white 3 (pkg. of 10)..
3in white 4 (pkg. of 10)..
3in white 5 (pkg. of 10)..
3in white 6 (pkg. of 10)..
3in white 7 (pkg. of 10)..
3in white 8 (pkg. of 10)..
3in white 9 (pkg. of 10)..
3in white a (pkg. of 10)..
3in white b (pkg. of 10)..
3in white c (pkg. of 10)..
3in white d (pkg. of 10)..
3in white e (pkg. of 10)..
3in white f (pkg. of 10)..
3in white g (pkg. of 10)..
3in white h (pkg. of 10)..
3in white i (pkg. of 10)..
3in white j (pkg. of 10)..
3in white k (pkg. of 10)..
3in white l (pkg. of 10)..
3in white m (pkg. of 10)..
3in white n (pkg. of 10)..
3in white o (pkg. of 10)..
3in white p (pkg. of 10)..
3in white q (pkg. of 10)..
3in white r (pkg. of 10)..
3in white s (pkg. of 10)..
3in white t (pkg. of 10)..
3in white u (pkg. of 10)..
3in white v (pkg. of 10)..
3in white w (pkg. of 10)..
3in white x (pkg. of 10)..
3in white y (pkg. of 10)..
3in white z (pkg. 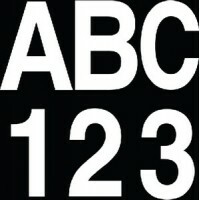 of 10)..
No more bubbled, mis-aligned or wrinkled decals. 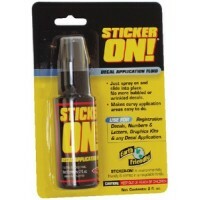 Simply spray Sticker-On on the back of your decal, ..
3in black 1 (pkg. of 10)..
3in black 2 (pkg. of 10)..
3in black 3 (pkg. of 10)..
3in black 4 (pkg. of 10)..
3in black 5 (pkg. of 10)..
3in black 6 (pkg. of 10)..
3in black 7 (pkg. of 10)..
3in black 8 (pkg. of 10)..
3in black 9 (pkg. of 10)..
3in black a (pkg. of 10)..
3in black b (pkg. of 10)..
3in black c (pkg. of 10)..
3in black d (pkg. of 10)..
3in black e (pkg. of 10)..
3in black f (pkg. of 10)..
3in black g (pkg. of 10)..
3in black h (pkg. of 10)..
3in black i (pkg. of 10)..
3in black j (pkg. of 10)..
3in black k (pkg. of 10)..
3in black l (pkg. of 10)..
3in black m (pkg. of 10)..
3in black n (pkg. of 10)..